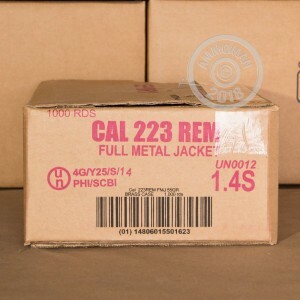 When it comes to 223 ammo for your AR-15, you know you want it cheap, you want it reliable, and you want as much of it as possible. These rounds from Armscor and lightning fast shipping from AmmoMan.com ensure you get all three! 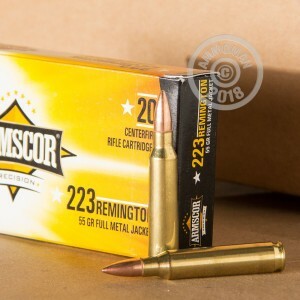 This 223 Remington Ammo is brand new production, with new, never-fired brass cases, 55 grain full metal jacket (FMJ) bullets and boxer primers, which is a good set-up if you’re the type that likes to reload. Looking at the ballistics, these rounds deliver a muzzle velocity of 3,050 feet per second and a muzzle energy of about 1,135 foot pounds. Plenty fast for plinking and making the most of your trigger training time. 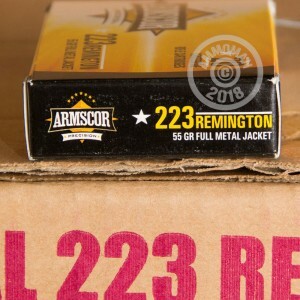 One of the things that draws shooters to Armscor Ammunition 223 Remington is the value you get. Armscor is known as a reliable ammo that is produced to SAAMI specifications. This means you get to throw a lot of lead down range without forcing you to empty your wallet in order to do it and without the frustration that comes along with constant feeding problems. Armscor Ammunition stands for “Arms Corporation of the Philippines. With a history dating back to just after World War II, the company has developed a reputation for producing quality ammunition at great prices. Find out why recreational shooters all over the country treat their AR-15’s to Armscor and pick up a case today.